Wine on its own is a layered experience. There’s fruit, earth, and a kaleidoscope of secondary and tertiary aromas and flavors. But what is in the glass can also be affected by what’s going on around us, specifically sight and sound. 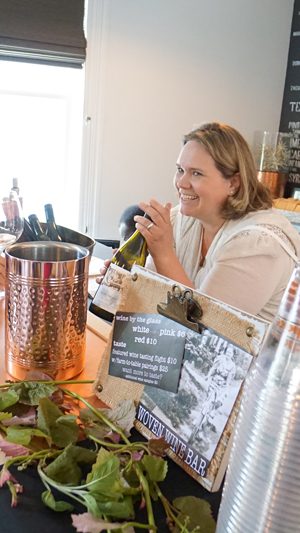 Elaina Spring, co-owner of Woven Wineworks, has been exploring wine’s full sensory experience through a series of pop-up events that began in May. She orchestrated a journey of taste for her inaugural gathering at Cellar 503 in Portland. She covered the reclaimed hardwood tables with detailed facts and examples of salty, sweet, sour and bitter flavors. 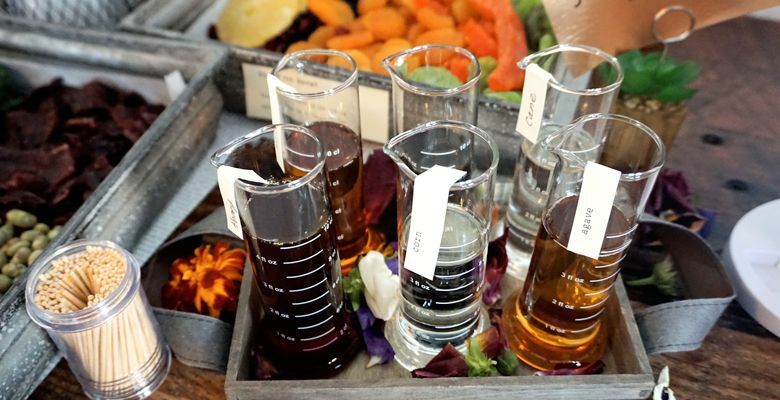 With beakers of different liquid sugars, a tray of dried fruit, such as apricots, kiwi and mango, and an array of bitters, guests were able to sample and note for themselves what area of the tongue registered each subtle — and not so subtle — note. True to her culinary passion, the highlight of the event was the thoroughly considered wine and tasting menu. Guests nibbled grapevine-smoked steelhead alongside local cheeses served with Spring’s own vineyard honey, Pinot grape jelly, rosé-soaked raspberries and Pinot Noir-soaked blackberries. S’mores with artisan chocolate and home-made Pinot Noir marshmallows were also served, roasted on site over a small bonfire of grapevines seasoned with Pinot potpourri. It was evident that the wines served with the food — and in the food — were just as thoughtfully crafted. Her brand story also shows signs of great consideration and zeal. Spring co-owns Woven with her uncle, Jim Allen. As a Certified Meeting Professional (CMP), who offered her expertise to the 2010 Olympic and Paralympic Winter Games in Canada, she possesses unique qualifications. The recipient of a box of photos after the untimely death of her mother in 2011, Spring is now the self-ascribed keeper of her family’s legacy, too. The previous year, her uncle had purchased 35-acre Covey Ridge Farm; he and his niece entered into a partnership with Covey Ridge Vineyard and Woven Wineworks. Sifting through her precious box of memories, Spring noted one in particular. It was clearly labeled “No. 1” on the back and, as she continued to piece together snapshots that dated as far back as the 1930s, she realized her quest to communicate the heart of Woven. There’s her great grandma sitting proudly at her first kitchen table in her first house — it was actually a canvas tent — writing a letter to relatives on the East Coast. This photo graces the 2012 Oregon Pinot Noir (No. 1). Then there’s Great Uncle Terry learning to play fiddle from an area farmer with Spring’s grandmother — Terry’s mother — standing on the front porch behind him in the photo. It adorns the 2013 Kinfolk Private Reserve (No. 2). The most recent addition is the 2016 Sweet Celebration Blend (No. 10), crafted from Riesling and Chardonnay. 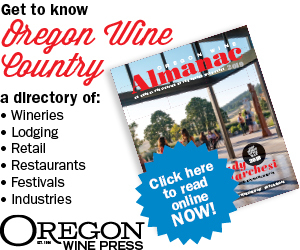 She personally made the wine with winemaker Michael Lundeen of Walnut City WineWorks and Lundeen Wines in McMinnville; he mentored her every step of the way. All the grapes for the wine were picked by family and friends; and the final product was presented to her uncle, Jim, and aunt, Lynn, on their 40th wedding anniversary celebration at Lewis and Clark Law School, where the couple first met and were married — appropriately, Sweet Celebration’s label features their wedding picture. As for marketing the rest of the wine, Spring has some fun ideas to engage customers. In June, she guided attendees through a music and wine pairing. Inspired by a blind tasting she conducted in which wines were presented with different genres playing in the background; she was intrigued to discover that the tasting notes were completely different for the exact same wine. “I think it’s fascinating how outside influences can change our perception of what we’re tasting,” Spring said. Lacking an on-site tasting room, Woven Wineworks markets predominantly through pop-up events and tastings at local wine shops. Plans are in the works to acquire more land to build an on-site facility and Spring’s ultimate goal is a space large enough to host farm-to-table dinner events. The vineyard features approximately 15.5 acres planted to Pinot Noir and just over two acres in Pinot Gris, plus the experimental block of Riesling and Chardonnay. For now, Covey Ridge sells the majority of its grapes but keeps a small amount for the Woven brand. So, is what’s inside the bottle as good as the packaging? Absolutely. Crisp, bright whites; delicate and earthy Pinots; and a deeper, luscious red blend of Cabernet Sauvignon, Merlot and Carmine. Woven is currently focused on growing their white offerings, as well as introducing a sparkling program — No. 11 will be bubbles — and continuing single-vineyard Pinot Noirs. 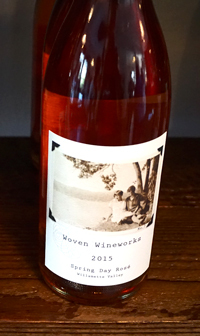 Taste for yourself at Woven’s upcoming pop-up events, both held at the Cellar 503 tasting room in Portland (July 21: See; Aug 18: Smell). Viki Eierdam is a freelance writer. She lives in Battle Ground, Washington. Connect with her at savorsipandsojourn.com.